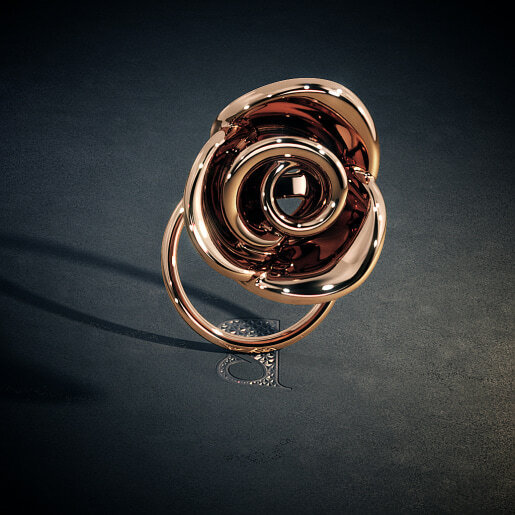 Who would have thought that a tiny accessory could transform the way you look and feel? Well, that’s what nose pins do. Irrespective of their shape, size, and design, nose pins add a feminine elegance to your face and a hint of unmatched charm to your overall look. If there’s something called “being dressed to kill”, you can make it happen by accessorising with one of our party nose pin designs! 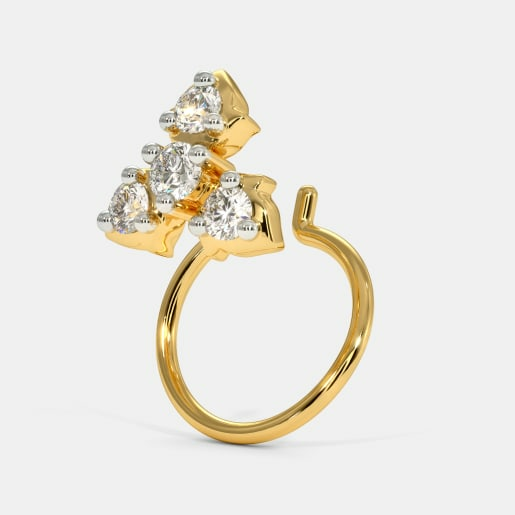 Our handcrafted collection of nose pins add an aesthetic appeal unlike any other piece of jewellery. Although wearing a nose pin is an age-old tradition in India, it has now become a fashion statement that has got women of all ages, and even men, hooked to them from the moment they try one. Check out the assortment of nose pins in our selection. You’ll be addicted to them, we promise! Apart from being stunning pieces of jewellery that have the power to change the way you look, nose pins are also embraced by people worldwide as they are great accessories to make a statement. Nose piercing, like other body piercings, is one of the ways chosen by people all over the world to customise their body according to their individual style and personality. For some people, it is also a way to show rebellion. Whatever the symbolism people have regarding nose pins, party nose pins are the best way to take your party dressing to the next level. Whether you are dressing up minimally or wearing an elaborate outfit, embellish your face with a lovely nose pin to make a lasting impression on everyone around you. The selection of party nose pins available at BlueStone is designed to spark a fashion trend. You will find nose pins made of 18kt gold and white gold, pieces designed only with plain gold, and nose pins studded with diamonds. 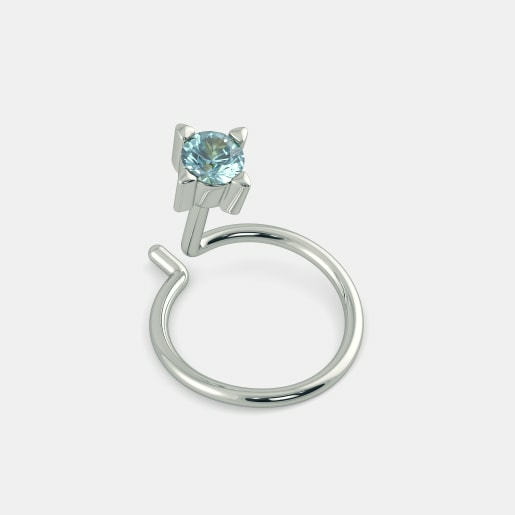 We have a variety of nose pins featuring colourful precious gemstones. You can choose your favourite colour or match it with your party wear dresses or special occasion clothes to complete your look for every party. You can either pair them with other pieces of complementing yellow or white gold jewellery or wear them as standalone accessories. Buy party nose pins online at BlueStone to ensure you get only the best adornments in the world of jewellery. Whether you like to dress up like a diva or like to keep it subtle and simple, we have the right nose pins for you. Choose from a wide range of styles, studded with the brightest stones in different shapes and sizes. The Wisteria Nose Pin is bling with the four diamonds studded on it and yet looks subtle with its delicate design. 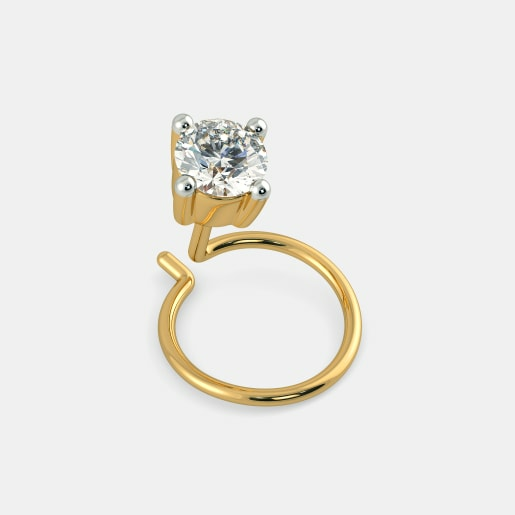 Similarly, the Arum Nose Pin is crafted in 18kt gold and studded with four diamonds with three smaller diamonds below one bigger stone. 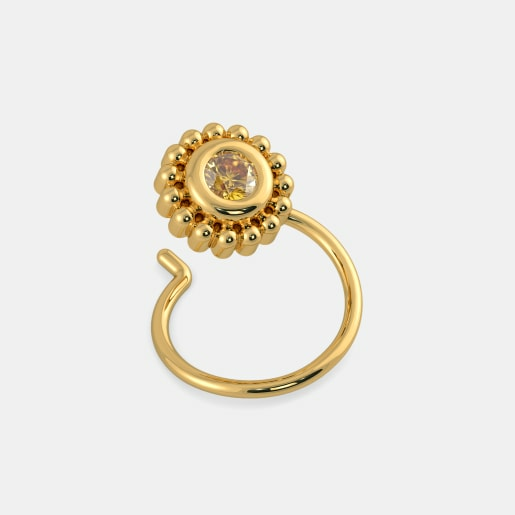 The only difference between this nose pin and the Wisteria Nose Pin is that in this one the smaller stones are wrapped in a layer of gold that balances the sparkle of the diamonds with the sunny yellow colour of the gold. 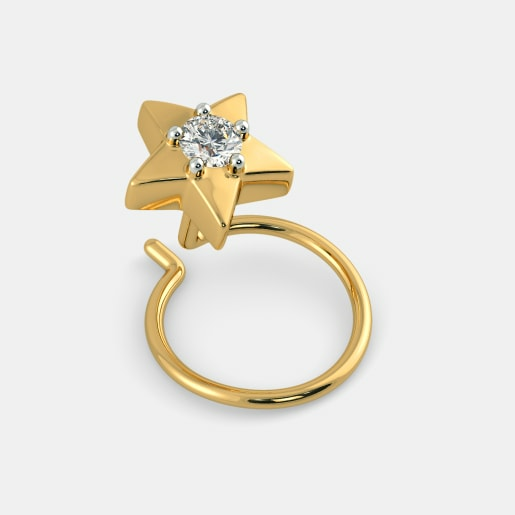 In simpler designs featuring a single stone, we have quite an assortment for you. 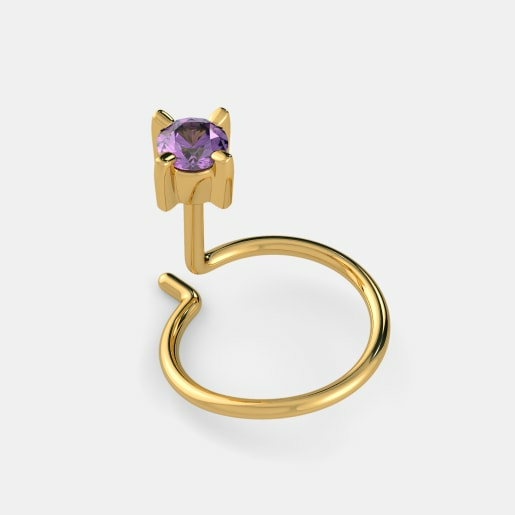 While the Mimosa Nose Pin features a sparkling round diamond, the Thistle Nose Pin is studded with a rounded royal purple amethyst. 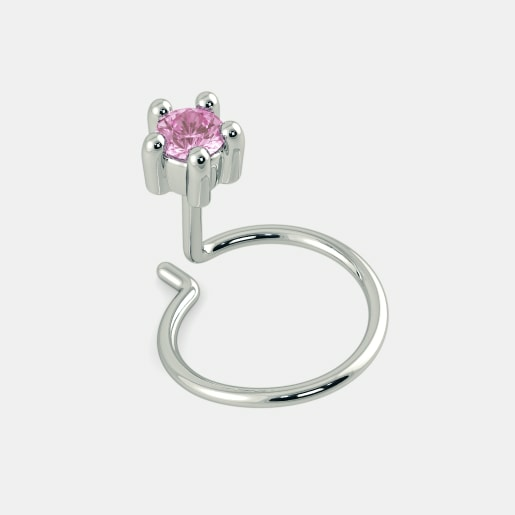 Other nose pins with circular stones in our collection include the Primrose Nose Pin with a yellow sapphire, the Peony Nose Pin with a rare pink sapphire on 18kt white gold, the Tansy Nose Pin and the Melek Nose Pin with a bright red ruby each, and the Tien Nose pin with an emerald. If you want a nose pin studded with a square-shaped stone, you will love the Jasmine Nose Pin made of 18kt white gold and encrusted with a dark blue sapphire and the Japonica and the Juniper nose pins studded with a ruby and emerald respectively on 18kt gold. At our attractive party nose pin prices, you can be party ready anytime! Browse our collection to pick your favourites.